While the world is going crazy about the recent changes in Google Reader, the debate over the relevance of RSS is still a hot topic among many techies. Many bloggers and even celebrities are moving away from the popular syndication format thanks to the dearth of decent RSS applications on the desktop and also due to the rapid surge in the use of social media. Even as the desktop sees a fall in the number of RSS readers, an opposite trend seems to be happening on the mobile front. Every week new feed readers are popping up in the Android and Apple app stores that provide the same old syndication with a different twist. Furthermore, with added capabilities like syncing and sharing, these applications make content consumption a fun experience. While many of them are good enough just to 'do the job', there are only a very few which have transcended the concept of the traditional RSS reader. So, if you've just purchased a new Android device and you're dying to read all the latest and the upcoming TechSource articles on it, read on as we list the absolute best feed readers for Android. This is the official Google Reader app for Android. Now, as everyone knows, Google Reader is the most popular RSS reader on desktop, and believe me, you won't be disappointed with its mobile version. The app syncs with your Google account and lets you keep up with your favorite sites anywhere you want. All your folders and your starred items are synced between your web account and mobile. So, if you read or star a story on your mobile, it will take effect immediately on the web version. The free application also features a neat and clean interface letting you focus on the content and nothing else. The blue bar at the top lets you either 'star' a particular story or share it with your friends. To cycle between articles you can use the 'up' and 'down' buttons at the bottom. Finally, if you want to look for a new feed, just hit the search button on your phone and start searching for it. So, in short, you get almost the same GReader experience as you would get on the desktop. 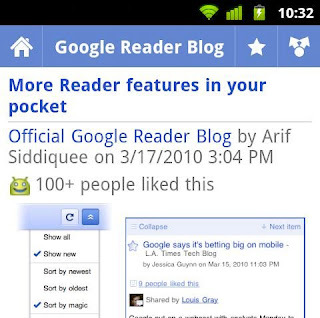 Google Reader for mobile is freely available for download from the Android marketplace. 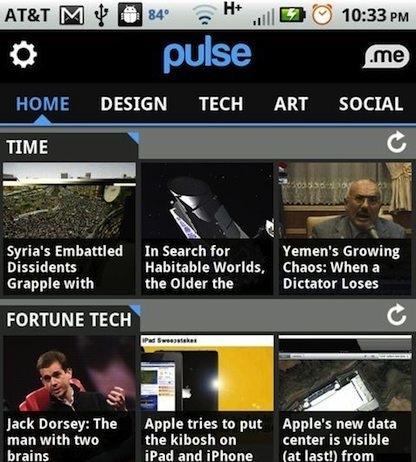 Pulse is one of the most promising apps for mobile. The app has gotten so popular that it was even praised by the late Steve Jobs during an Apple conference. Developed by Alphonso Labs, Pulse comes with a nice tiled user interface that incorporates colorful panning story bars and fills them with content from your favorite sources. You can view news from your favorite sources (imported from Google Reader) or discover new ones from their list of curated feeds. You can also share the story on your favorite social media networks like Twitter, Facebook with a click of a button. Another thing that I loved about Pulse is the 'drag to refresh' feature. To refresh your sources instantly, all you have to do is drag the pane in the downward direction and release it. Furthermore, you can navigate between different sources using tabs at the top. Finally, if you own multiple devices, let's say an iPhone and a Droid, you can sync your preferences between both the devices using Pulse's cloud-based service. 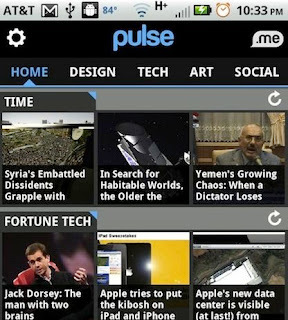 Picked as the editor's choice for Android Marketplace, Pulse is freely available for download. Feedly is a beautifully designed RSS feed reader for Android, iOS, Desktop and Web. Personally, I use Feedly on a daily basis, and so far, it is the best RSS feed reader I've used. The ability to seamlessly sync with Google Reader is what makes Feedly stand apart from the crowd. Sporting a clean, content-focused interface, Feedly turns your Google Reader into a convenient magazine. The free app displays all your favorite articles in a clean, slick format with full support for gestures like zooming, 'pinch to close' and more. The other advantage of using Feedly over the time-honored Google Reader is that it comes integrated with various social media services like Twitter, Facebook and even ping.fm. For sharing the articles, you can also customize Feedly to use your own bit.ly account. The sources in Feedly are neatly organized in categories. You can jump between various categories by simply hitting the drop-down button at the top. You can also find new blogs right from the search bar and add them to your sources. Every time you create a new category, it gets automatically synced with your Google Reader account. So, let's say, you added TechSource to your list of sources and put it in the category 'Open Source'. Now, the next time you'll check your Google Reader account you'll find a new folder by the name 'Open Source' with 'TechSource' added to it. Cool huh? 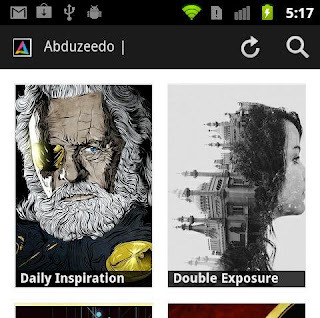 With 4.6 rating, Feedly is freely available for download from the Android Marketplace. That's it? No apps like Feeddler or Reeder? I'm actually quite disappointed.